Nestled in one and a third acres of tropical gardens and with 6,600 sq feet of interior space, Neveah creates an oasis of calm. Antique Balinese temple doors open onto a Japanese courtyard; a serene welcome into the villa's spacious great room which overlooks the swimming pool and the ocean beyond. Positioned on either side is the media lounge and gourmet eat-in kitchen, with terrace dining. 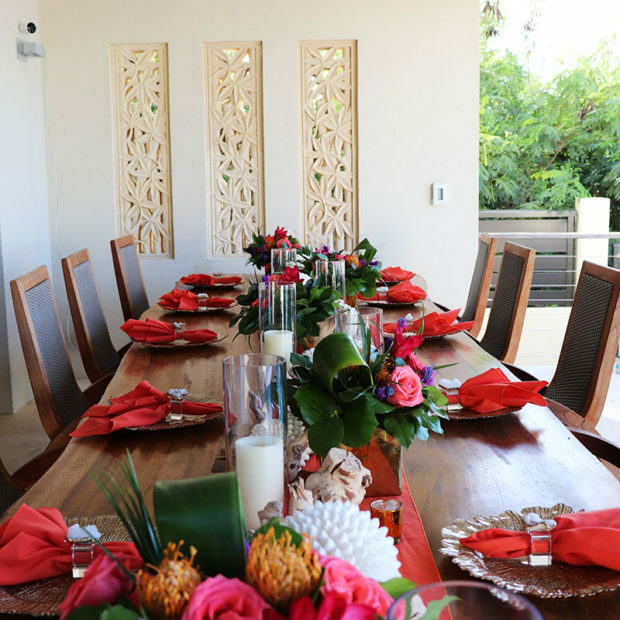 The Guest House is also equipped with a nearby combined kitchen-living room and an outside dining area. 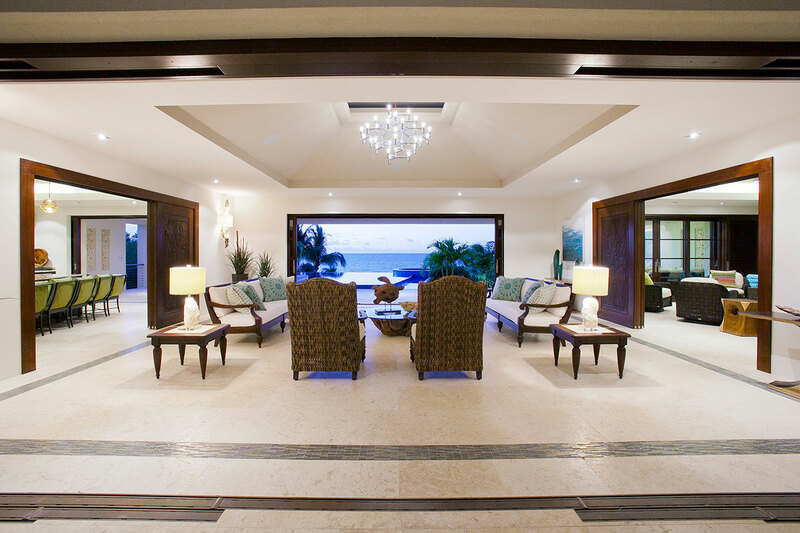 Entering the great room from the courtyard, guests are greeted with stunning vistas of the aqua blue glass-tiled swimming pool with the ocean beyond. High ceilings and fully retractable sliding glass doors create an open and airy feel, allowing guests to enjoy indoor-outdoor living (the great room may also be air conditioned.) 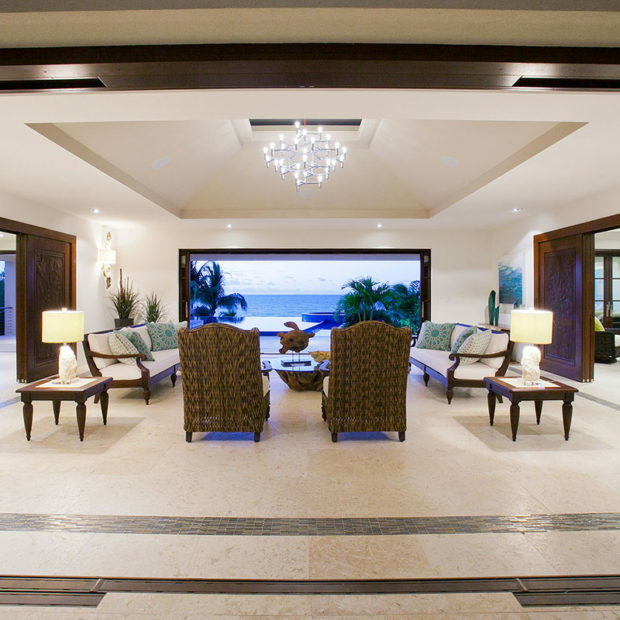 Wooden couches and arm chairs are positioned so that all guests can take in the breathtaking views and on either side of the great room, magnificent carved mahogany door panels separate this space from the media lounge and gourmet kitchen. Adjoining the great room, the air-conditioned media lounge features a 70" TV, Blue-ray DVD player and an X-Box game console. 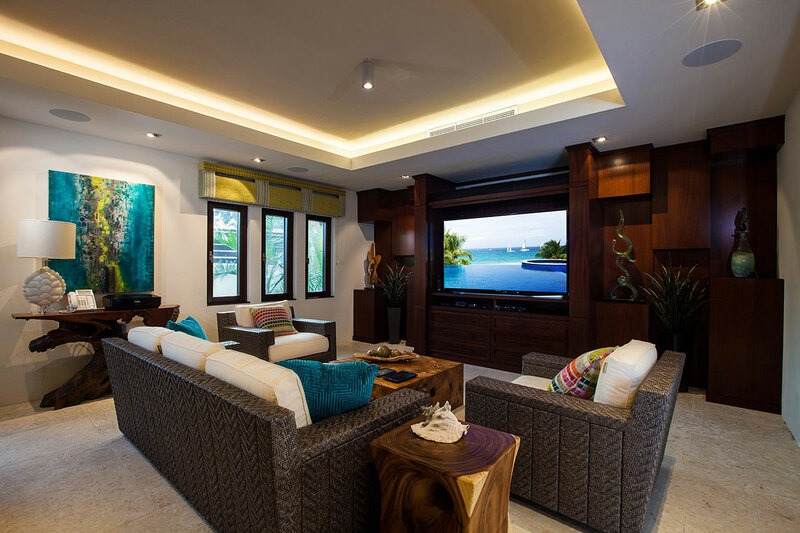 A Sonos surround sound system plays throughout the villa and complimentary Netflix access is provided along with satellite tv and high speed broadband internet. Furnished with casual wicker couches, rocking chairs and a seating area where board games can be played, the media lounge also offers a lap top and printer for guests' use. 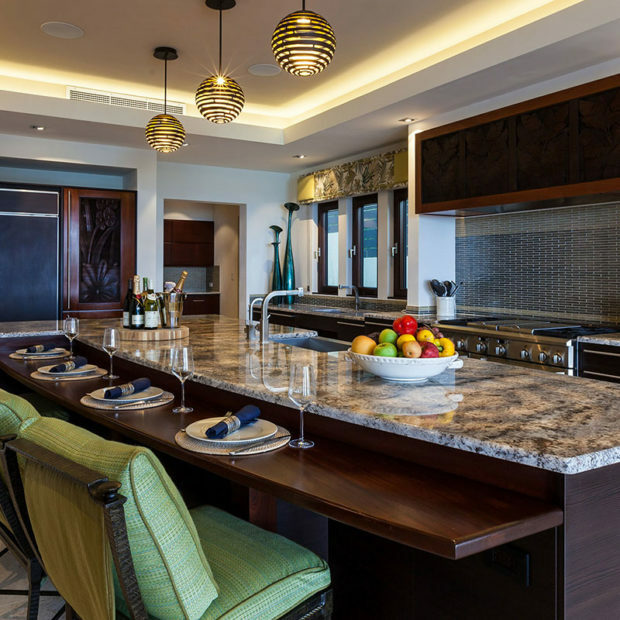 On the opposite side of the great room is the gourmet, eat-in kitchen featuring multiple refrigerators, including a GE SubZero fridge and wine cooler, along with a Pro Range stove, farmhouse sink, walk in pantry and granite topped bar with comfy seating for six. 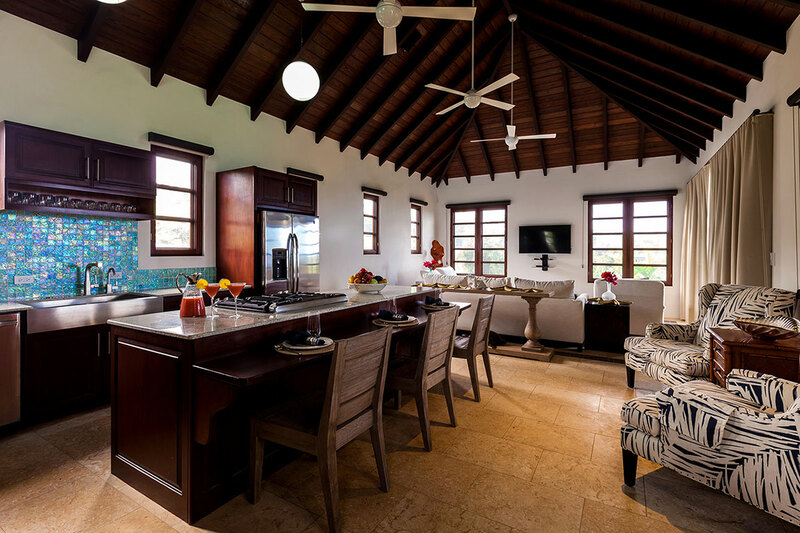 The villa is also equipped with two barbecue grills. Sliding glass doors open up onto the covered dining terrace that overlooks the pool. 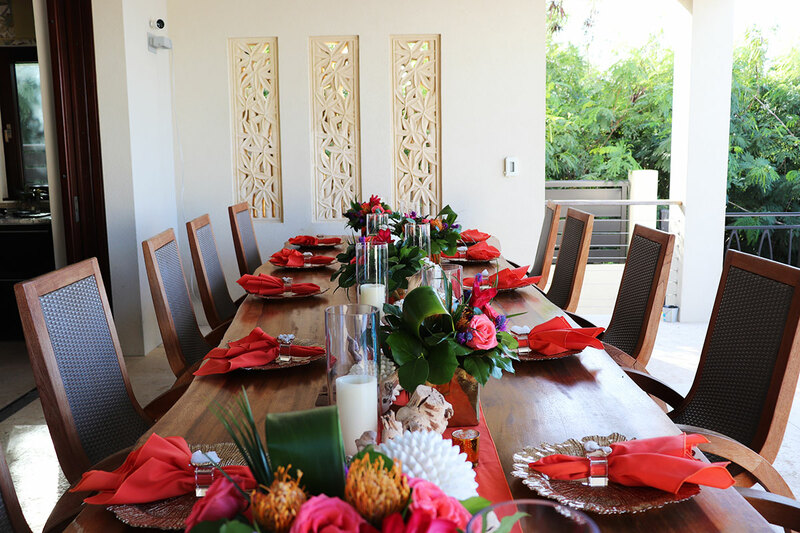 Featuring intricately carved stone wall panels at one end, the Balinese, live-edge wooden table seats up to 18 guests. 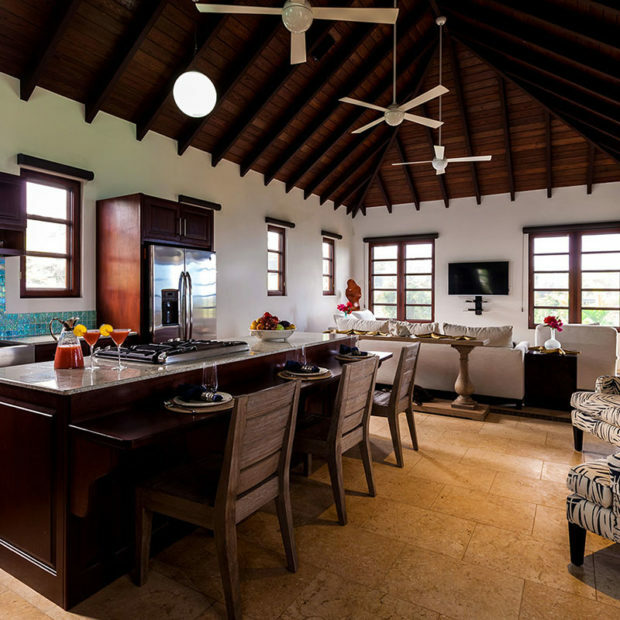 On the upper floor of the guest house is a second, well equipped kitchen with counter top seating for three guests. 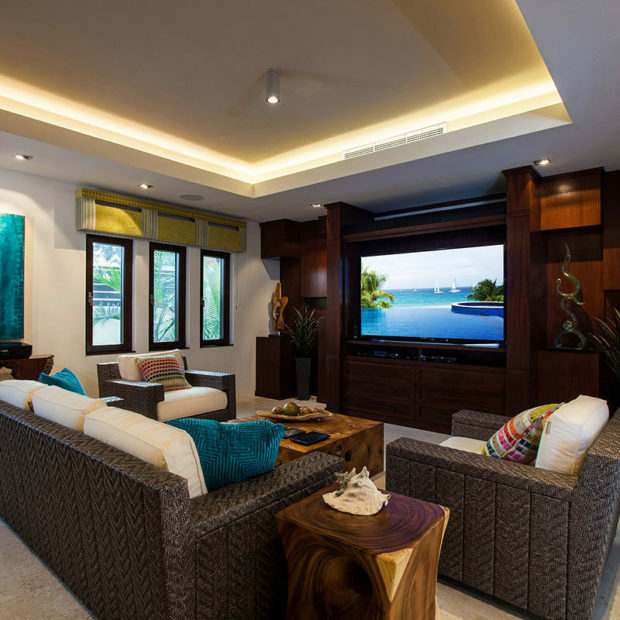 At the far end of the room is the living area with couches, a chaise lounge and flat screen TV. Multiple ceiling fans and screened windows allow for natural cooling in this room. 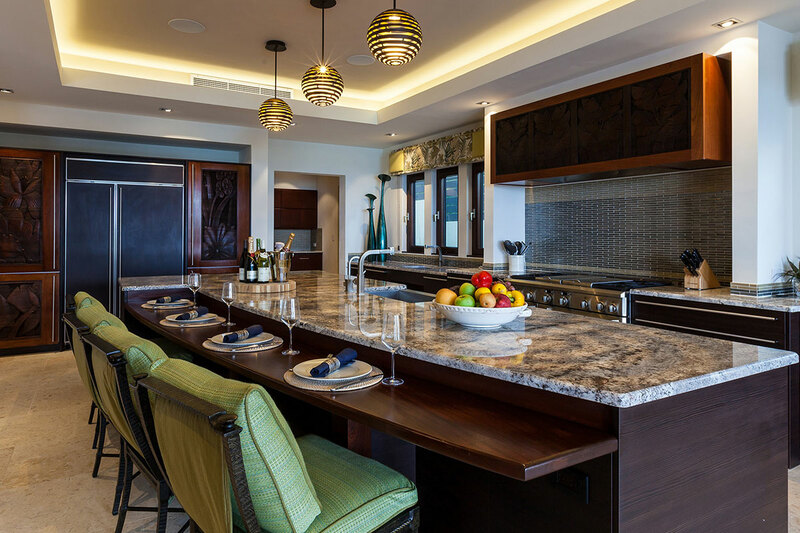 A spacious outdoor terrace features a dining area with ocean views.